We receive many enquiries about OR practices and questions/misunderstandings about the Runic Era are not rare. I had considered writing a brief explanation of what it is and why we use it, but it got put aside with other matters which seemed more important. But recently also, one of the news feeds from the Odinist Press Service drew attention to the fact that there was a move to change history so that it fitted a more establishment sanctioned view, rather than the facts. Of course that process is nothing new and history as recorded often has no relation to the actual true facts. In recording wars it is the victors who write the dominant history. Later those “facts” may be altered again. Rather than detail all the ways history can and is at times incorrectly recorded, let us just accept that fact and realise this process begins almost immediately. Within the “history” of the New Awakening, already some try to present things incorrectly, I have personally been directly involved in things which have been misreported and presented as fact. There is little really we can do to stop this, though we can at least state the facts of some things so that at least there is a factual record. And this is one of those writings where the why and how the Runic Era came about can be truthfully presented. And judging by the erroneous beliefs some have about it, this would seem a needful thing. Here then are the facts. When Hoskuld and Stubba were preparing to launch the Odinist Committee for the Restoration of the Odinic Rite (which, as we know, later became known simply as “The Odinic Rite”), they planned to lay as comprehensive a foundation as possible to build our movement on. Hoskuld had been involved in Odinist groups since the 1930s ce so he had considerable experience to work from, and though not becoming restored to Odinism until a couple of decades later, Stubba had considerable experience of organising committees, groups etc. It has to be understood that when the OR was formed, Odinism was virtually unheard of; the OR was forging basically unknown, or rather long forgotten paths. Hoskuld and Stubba realised that the OR had to present an identity, something tangible so that Odinism – when it was known – had a definition and wasn’t deemed as just another “heathen/pagan” group or some new idea. So as well as laying down the NNV and the early blue print for the OR, they also reasoned that to show Odinism was a pre Christian religion, it should have its own dating system, which pre dated the common era (which of course is based on Christian mythology). So that is why we created the Runic Era, to emphasise that Odinism is the pre Christian indigenous religion of our people and to add to the defining of our identity as Odinists. The next question of course is when to begin or base this Odinic dating system. And that was a matter for debate. 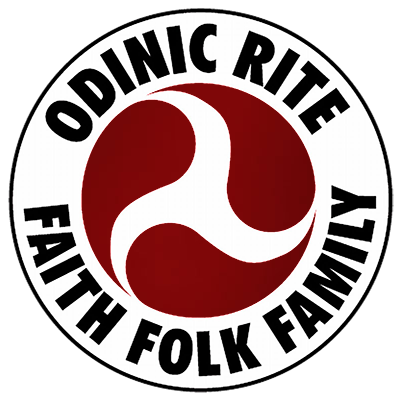 The Odinic Rite understand that Odinism is the current manifestation and name of the natural religion, wisdom, spiritual path, folkway – call it as you wish – of our folk organism, the Northern Indo European Folk organism. As such it is as old as our folk and has found the earliest accepted expression in the Vedic texts, which were written by our ancient Aryan ancestors. This understanding is detailed more clearly in other OR writings, but for this article it suffices to say that Odinism is essentially as old as our folk unit. But how old is that? No one can say for sure and there is speculation and debate about this. Anthropologists and archaeologists do not agree and it all comes down to theories. And that is what they are, theories. Some will base their opinion on archaeological artefacts, others on myth. And these myths themselves have different layers. Some, including many senior OR members, pay heed to the Vedic time scales and the Hyperborean mythology. But such venture into the more esoteric avenues. The OR do not have an official stance on this and so the fact remains, that no one can say for sure exactly when our people came into existence on Midgarth. At the time they were formulating a suitable date and due to the fact that Odinism itself was basically unknown, they also felt that to include a dating system which was more in keeping with a Vedic time scale (or one which was related to esoteric areas), would make things seem too exotic to a basically unknowing public of the time and so consign Odinism to being considered “strange.” So one which would be more accessible to the general western public (including many of the early Odinists of the 1970s ce.) was felt to be most pragmatic. But still it left the consideration as to what precise dating to use. Various possibilities were discussed; but as they believed that archeological discoveries from 250 BC showed runic glyphs were being used, they decided this was as good a date as any. It was not an outlandish date (outlandish to the western public that is), but was clearly showing pre Christian use of Odin’s script. Another side consideration came into it, though this was one on which there could be much debate. Some have theorised that the figure of Odin is based upon a tribal king who led his people into Scandinavia and became identified with Odin the God, possibly in a similar manner to that of the Manu of Vedic myth. This is not a theory I currently know a great deal about, but Hoskuld felt that there was some evidence for this occurring around 250BCE. This coupled with the believed use of runes and the fact it was considerably before the advent of Judeo Christianity – yet not entering into realms which are unfamiliar with most of the western population – meant this date was decided upon. As you will see it was a pragmatic decision and arbitrary. Does it signify we believe Odinism started at that date and not prior to it? Absolutely NOT! For as said – but I will say it again to make it clear: The OR holds that Odinism is the name given to the contemporary manifestation of the indigenous religion/wisdom of our folk unit which is as old as our folk. There are other dating systems used by those who claim our religion, some setting a much earlier date for their beginning and some a much younger one; for example, some have, or do, use the AT date, which is “After Teutoberg” and recalls the battle of Teutoberg where the Germanic hero Herman defeated a Roman army. But any dating system has its pros and cons. For us, the matter is settled and it is not something we need expend time upon: it is the OR official policy that this is the dating system we use. So one could say in many ways it is symbolic rather than literal to us, and that would be correct. Hopefully this clears up any misconceptions.